We all love to have a little comfort food every now and again. Ok, well, maybe a little more than that. My philosophy on food is that 85 percent of eating should be clean and reasonable while the other 15 percent should provide the opportunity for some indulgence–but never enough indulgence to ruin the hard work I put in. Furthermore, I wholeheartedly believe in cooking what you want and saving the cash. It is such a rewarding feeling! In honor of this philosophy, I want to share this recipe with you so that you can indulge on your cheat day (or any day you choose !). These fries are hearty enough to be a full meal, but could also be served in appetizer-sized portions. Who could argue with ground chicken or turkey substituted for beef, baked fries instead of greasy ‘taters, plain Greek yogurt subbed in for sour cream, loads of chopped veggies and black beans instead of fat, and a sprinkle of cheddar cheese??? Man, I am ready to make another batch right now! Ok, maybe not, in light of the brownie I just had 🙂 But, the point is this: cleaner choices mean you will feel better and tasty options like this help us stay on track. So, here ya go! Hope you enjoy preparing and eating this as much as I did! Cheers to eating well, friends. Preheat oven to 425 degrees and let fries bake for 25 minutes (or until done to your liking), turning once for even cooking. On medium high heat, cook and brown ground turkey. Make sure to chop into small crumbles. When turkey is done, add diced veggies and garlic to same pan, pushing turkey to the side. Add tomatoes and remaining seasonings, stir, let cook for 1-2 minutes. Add black beans, cook for additional 2-3 minutes until beans are warm. Combine diced avocado, diced tomatoes, cilantro, lime juice and salt into a small bowl. Toss gently to mix. Once fries are done, season with sea salt, pepper, and garlic powder. 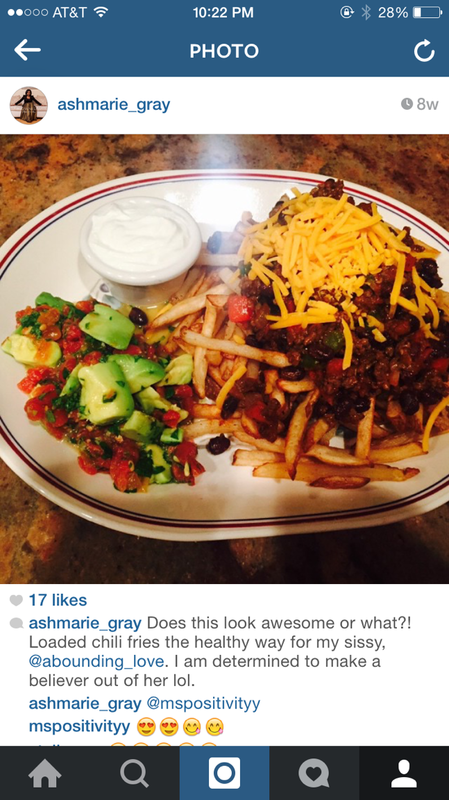 Layer fries with turkey chili mixture, top with cheddar cheese, garnish with avocado salsa, and serve with a side of plain Greek yogurt. Are You the Wise Woman?